The busy Naivasha-Maai Mahiu highway has on Monday been temporarily closed over cracks on a section of the road. 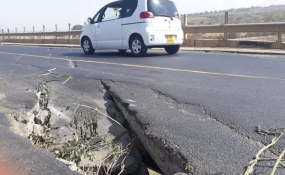 There were fears that the damage was linked to the light 4.8 magnitude earthquake that struck Kenya on Sunday but an engineer at the site blamed the cracks near the Fai Amario bridge to vandalism. Kenya National Highways Authority on Sunday warned motorists to avoid the road shortly after earth tremors were reported in many parts of the country. It is not clear when the cracks appeared at the section near the bridge, which is about 8km from Naivasha town. Naivasha MP Jayne Kihara on Monday visited the site and called for quick action citing the importance of the busy road to the economy. "We are yet to ascertain the cause of the damage but from a layman's perpsective we can detect poor workmanship," said Ms Kihara. The road is used by trucks plying the Eastern African region and is one of the busiest roads in the country. The vehicles were diverted to an earth access road, raising complaints from locals that the heavy traffic has led to a storm of dust. "Private vehicle operators are advised to use the main Kamandura Limuru-Kinungi-Naivasha Highway while heavy commercial vehicles operators are urged to exercise caution and restraint, and to follow traffic flow directions that are being provided by the Traffic Police Department." "Particularly, we advise all motorists to observe lane discipline and avoid overlapping, which can result in traffic flow disruptions," said KeNHa in a statement shared on their social media platforms. The residents, who engaged the police in five-minute stand-off threatening to block the diversion on Monday, want the dirt road sprinkled with water.